NewGround is proud to convene Muslims and Jews Inspiring Change: a high school leadership council. This program offers a select group of Jewish and Muslim high school students the opportunity to, build their leadership skills, create lasting relationships across faith boundaries and have an impact on important social issues in Los Angeles. An Advisory Board of Muslim and Jewish communal professionals have taken the lead role in working with NewGround to provide this opportunity for a cadre of teen leaders in Los Angeles. The City of Los Angeles Human Relations Commission is proud to support the project. Each year, a select cadre of teens is chosen to participate. After a fall retreat, the students meet twice a month to learn about how organizations in their communities respond to major social issues. During the spring semester, students then develop their own joint Muslim-Jewish response to a social issue they deem most important. Upon completion of the fellowship, council members receive a certificate from the City of Los Angeles in appreciation of their contribution to improving intergroup relations in Los Angeles and strengthening Muslim-Jewish relations. 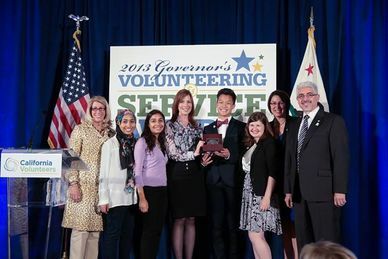 On Wednesday, May 22nd, NewGround’s Teen Leadership Program “MAJIC” received a prestigious honor from the Office of the Governor of California. This program that was just an idea no more than eighteen months ago has now been named “California’s 2013 Faith-based Organization of the Year” for cultivating a commitment to service an volunteerism in the greater Los Angeles area. A video of the ceremony can be viewed here. MAJIC was again selected as a Global Youth Service Day Lead Agency by Youth Service America. The student leaders of MAJIC engaged hundreds of their peers in service projects to build a healthier Los Angeles. The MAJIC change-makers visited schools, mosques, synagogues, and religious schools to educate the community about their work with NewGround. They implemented drives to support local organizations to help make Los Angeles a healthier community. It all culminated with a fun day for teens of food trucks, dodge ball and other exciting activities to help raise proceeds for the organizations chosen by students. Want to know what’s possible? KABC7 featured the pilot cohort of MAJIC in action with their Carnival Against Hunger.